Editor’s note: Mahdi Satri asked us to post this stating he fears for his life. We hope that he will be ok and stay safe. We have nothing but love and respect for him and wish him a long and happy life. No matter what happens, you are always a hero to us and we will not forget you. At his request, we are posting this here. I’m writing now with tears running down my face. I had a very long trip, and I’ll continue in this trip until the last drop of blood in my body. But I just wanted to share with you my sadness, my tears, and my pain. It’s really very hard to be a Zionist inside an arab village. A village full of hatred. I really think that the end is near. Many people are threatening me. People are promoting incitement against me in the mosques. I never ever thought that it would lead to this situation. I’m afraid to go to the shop near my house. I’m afraid to hang out in my village. I’m living in fear, the fear of getting stabbed in the street. And after that no one will remember me. No one will have that arab who’s fighting for his goal, because I’m just encouraging the Israeli arabs to stand against terrorism and to speak out. I became a target. A target for everyone. A target for the Palestinians. A target for my village’s citizens. A target for Hamas. A target for every single man in this world. I’ve never thought that to speak the truth about my beloved country would lead to becoming a victim. When I started my way, I did take it in my hands that I might be killed because of this, but not in this way. I’m just staying home all the day. When I see a car, I’m afraid that it’s someone who wants to kill me. No one can imagine this feeling. To live in fear , live with the possibility of getting killed any moment. It’s really a very terrible feeling. But no, I won’t just keep calm and not talk anymore. I’m not this man who will just leave when he feels danger. I won’t just keep calm. I won’t !! I wont escape and just disappear! I’ll fight. I’ll fight alone. Against all the terrorists. Against all the people who want me dead because I’m going to serve in the military. I won’t!!! This is a message. it’s not an article … I want to tell you I’ll keep fighting against all the terrorists, against our enemies. The enemies that don’t want me to speak out and to stand against them… I want to tell you , that I might see tomorrow. And this message might be my last message. But just know something: if I died and if they succeeded to kill me, know that I died a Zionist defending my country. And know that I was smiling while dying because I’ll die for my country. And it’s really a very big honor. Know that I died and I have a dream. Know that I died a dreamer. A dreamer looking for a new future empty of hatred and full of love. Know that I died for a goal, not for nothing. Know that I died and Zionism in my cool blood. Know that I died a fighter against them… Like I said: Three words, one point:AM ISRAEL CHAI! THE QURAN READS ) BE GUIDED by the TORAH of MUSA ) and “DO NOT RAISE WEAPONS” even if a Weapon is raised against upu, RETALIATION and EDITADA are illegal under ISLAM and Christianity and Judaism. In fact that is why ( Judah was scattered because the took revenge and murdered 1 innocent man. ( I NOTICED THIS) ” I’m just encouraging the Israeli arabs to stand against terrorism and to speak out. I became a target”. What a courageous young man! I am praying for you. 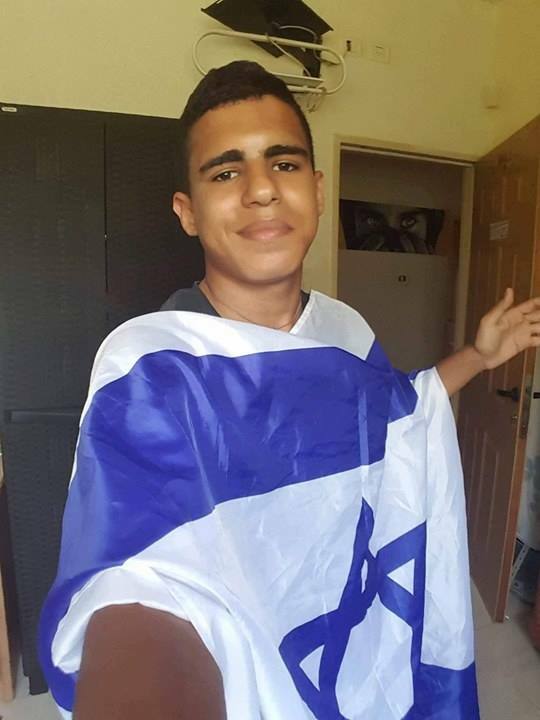 Fight on young warrior for Zion…Am Israel Chai!!!!! Can’t the Government help him in some way ? Move him to a safe place. I know plenty of towns and cities where Arab citizens are patriots and wouldn’t harm him in any way.
! אני אוהבת הגבר הזה. May Hashem support and protect you for your fighting for Tzeddek Ve Emmett! Justice and Truth! Please stay safe achi – we need good neshamot like you in this world. Ahm Yisrael Chai and again, may Hashem guide and protect you Achi. You must leave your village and find a safe place. You are worth more alive than dead. Alive you have the possibility to bring conciliation and love. You must protect yourself. Mahti Satri, If I lived in Israel, you can be sure my home would be open to you. Can you reach out to Stand With Us? I will keep you in my prayers to have a safe life and one day soon, one without fear. Please LIVE!!!! Do not submit. Embrace LIFE. The heroism is not dying, but living. Don’t stay with people full of hate. Escape! You can’t reeducate them. Only life will. Please LIVE! I pray for your safety. World needs you. Do not submit. I have made contact with Sara Zoabi… I am sure that if she already knows his case she will be doing all she can to assist him if the story is genuine. One has always to be cautious. Wish that all like him be taken care of. Matri- do you need a place to go to be safe? First of all contact the Israeli police or idf near you. Just get out of there. Then contact women in green, they will find you a safe place. May G-d bless, protect and watch over you Mahdi. May He take away your fear and surround you by good people and allow you to speak and live in Shalom. G-d bless you Mahdi and thank you! I and many millions around the world share your dream. Your determination to realize that dream – linked to others – will make it happen. Let us pray that you live to see that dream become a reality. Congratulations to this boy with admirable integrity. May his ability to think independently and resist cultural pressure, brainwashing and threats take him far. What strength and courage. I will pray for his safety! Mahdi, you are a very brave man. A role model for others, standing up for what is right! I don’t know if you will ever see this message, but as I pray for you, I hope God will encourage you and give you strength! I also pray for your protection and for wisdom in staying safe without compromising your beliefs. Thank you for loving your country. I am not sure what religion you are, but I wish you could read the book Seeking Allah, Finding Jesus about a young man who prayed to Allah asking him to reveal himself to him (the man). He did not hear from Allah, and became depressed, wondering what it was he had been living for if that one would not answer him. When he was going to kill himself, Jesus revealed himself to him, speaking to him. The Bible, God’s word, says “Believe in the Lord Jesus and you will be saved.” If you trust Christ for the forgiveness of your sins, your soul will be eternally safe no matter what they do to your body. But I pray that He will keep you safe and allow you to see your children’s children! Blessings to you! I wish he could move to a safe, Jewish, place, staying with a good Israeli family etc. He is in a huge danger currently. To Mahdi Satri: Get out of your village and change your name and identification now. You need to be alive and we need you alive. I love you, you are a noble human, man, and Moslem Arab, I wish more were like you! Go man, Go! Thank you for your honesty and your courage, Mahdi! Are you interested in leaving your village, or would you like others who support you to start visiting regularly, so that the haters see that you are NOT alone, but have a ‘Chevre’ who will look out for you? I’m happy to come visit after my return to Israel in 2 weeks. So that your village can see that there are people who support you as a proud fellow Israeli.